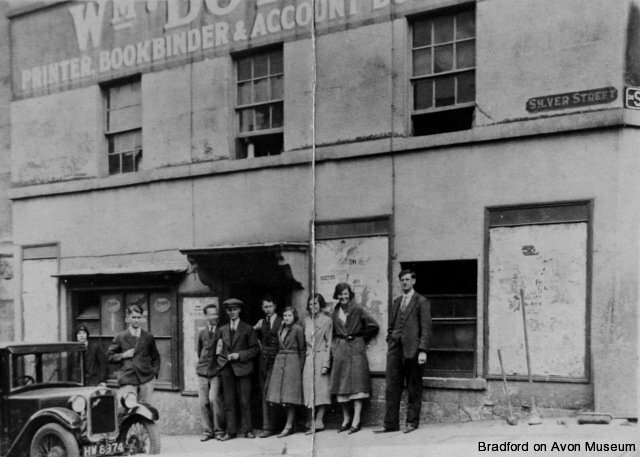 The staff of William Dotesio’s printing works outside the building in Silver Street in the 1920s. The firm was first Dotesio & Todd, in the 1890s as printers and account book manufacturers of Bradford and of Lowestoft in Norfolk. In the later 20th century, after William’s death in 1947, it became a limited company and set up large printing works at Greenland, in Bridge Street. With the redevelopment of Greenland in the 1990s it moved to Trowbridge, but then was forced to close. 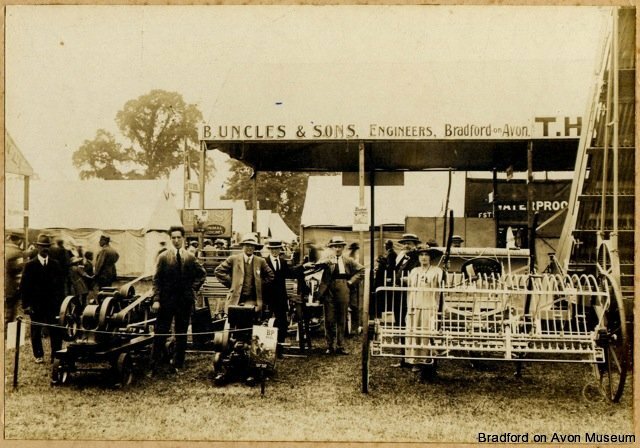 The trade stand of Berkley Uncles & Sons at an agricultural show -the Bath & West Show perhaps, or Frome Cheese Show- with members of the family amongst the machinery. Uncles’ is best known for the products of its iron foundry, but a good deal of their work was in making and repairing agricultural equipment and acting as agents for larger manufacturers. 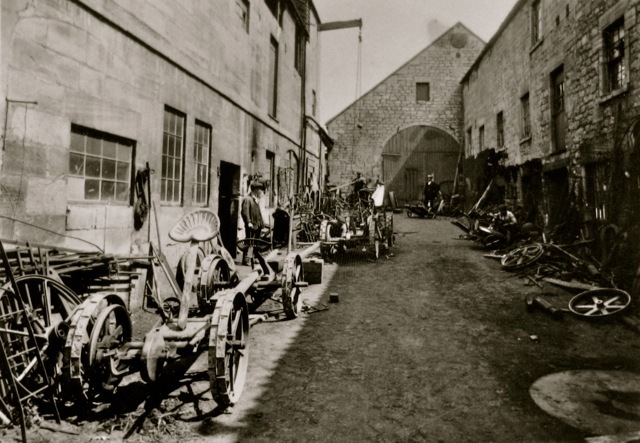 The yard of Uncles’ engineering works at the old iron foundry in Trowbridge Road. It is lined with pieces of agricultural machinery, but there are also wrought iron fencing and industrial parts. Berkley James Uncles himself, in a straw boater hat, is in the background. Workers at the Spencer Moulton Rubber Company in the process of making a rubber hose pipe. 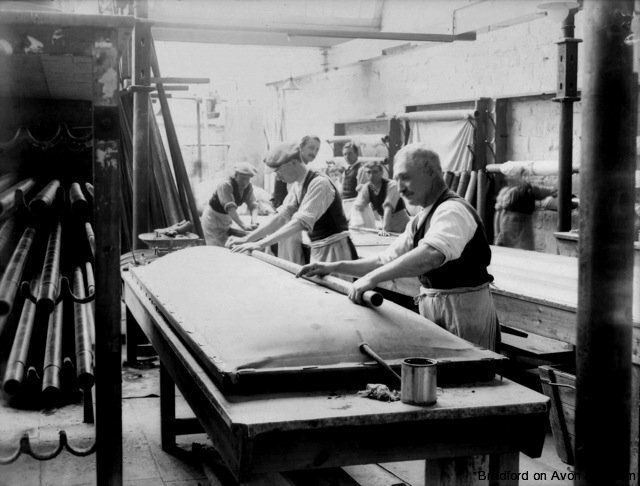 Sheet rubber and reinforcing textile were wrapped tightly around a steel tube before being cured by heating. Hoses, mostly large diameter, formed a large part of the company’s output. Then and under the ownership of the Avon company after 1955, the works also made hoses for railway braking and heating systems and for car engines. 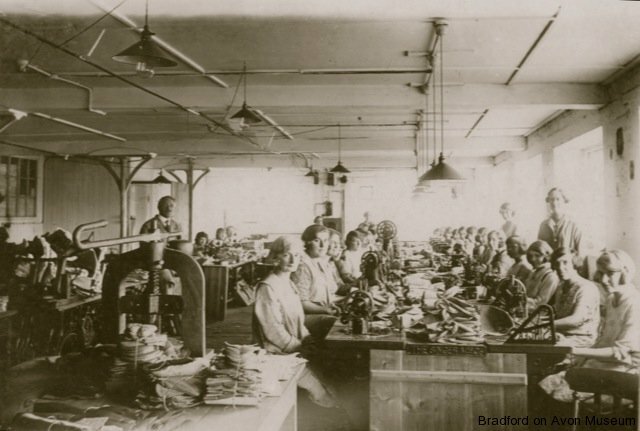 Bradford’s other rubber works was the Sirdar Indiarubber Company, which set up in the redundant mills at Greenland after Applegate’s woollen cloth company closed down in 1905. It was taken over by the Avon company at the beginning of the Great War in 1914. In the photograph (left) the workers are making bicycle inner tubes in the 1920s, after the Avon takeover. 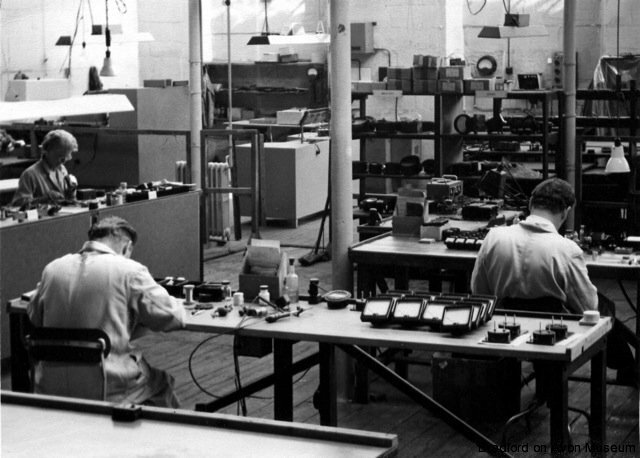 The Weir Electrical Instrument Company succeeded Sirdar in part of the old Greenland Mills from the 1930s. The Museum has the clock that was in the office and a barrow which was used to carry parcels along Bridge Street to the Post Office. The intended redevelopment of Greenland into housing meant the removal of several of the companies on the site in the 1980s. The Weir company was taken over in 1992 and is now P&B Weir Electrical in Leafield, Corsham. 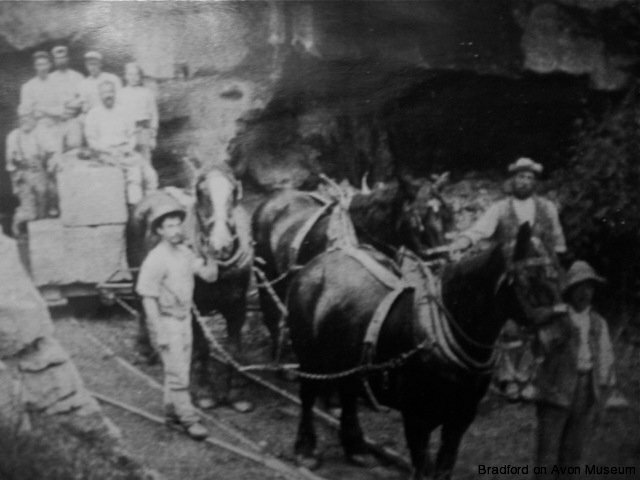 Quarrymen and their horses at Westwood Quarry, probably in the 1890s. The horses were used to haul the blocks of building stone from the underground workings along tramway tracks to the top of an incline. There, gravity took over the job of transport to the canal wharf at Avoncliff and a yard and siding by the railway on the other side of Avoncliff Aqueduct. Edward W. Stone came from Durrington, near Stonehenge and founded The Station Garage in Bradford in 1919. His health was poor and he died in 1940 at the early age of 49. From then until it closed in 2006 the garage was run by Jim King and members of the Moore family. The photograph shows Jim King and Bill Wadman with the petrol pumps and breakdown truck before 1935. Standing outside their shop at 15 St Margaret’s Street in the 1890s are members of the Burgess family, who were bakers there. Two of the boys have the baskets they used for deliveries on their shoulders. The window displays cakes, buns and loaves. 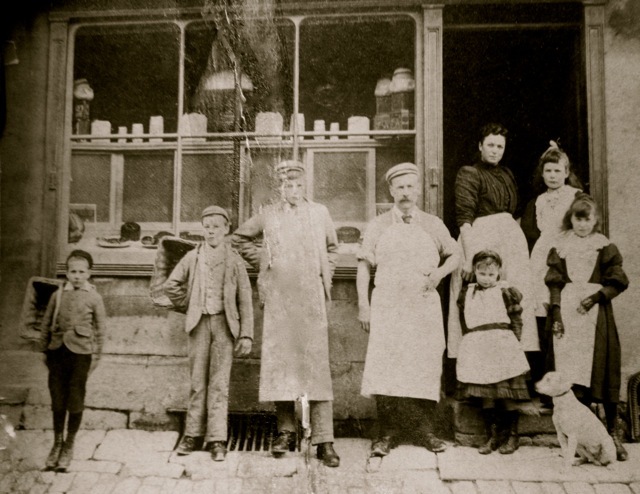 Jeremiah and Sarah Burgess had been bakers in Church Lane (Winsley Road) in the 1870s. 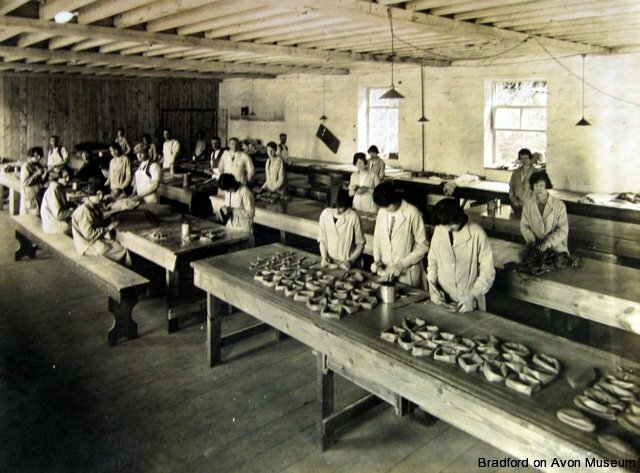 The glove-making workshop of Beavens’ leather factories at The Midlands, in Holt in the 1930s. All the sewing was done by women, while the leather was cut out by men. 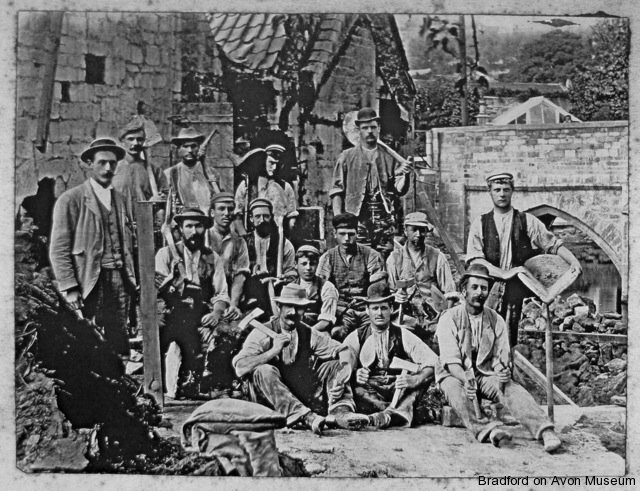 The group of builders who were making the embankment wall for the new gardens and baths in Bridge Street in 1896. They are carrying the tools of their trade: picks, shovels, hammers, scappling axes (for trimming stones), hods and a plumbline. In the background is one arch of the Town Bridge and the old buildings that were soon to be demolished. 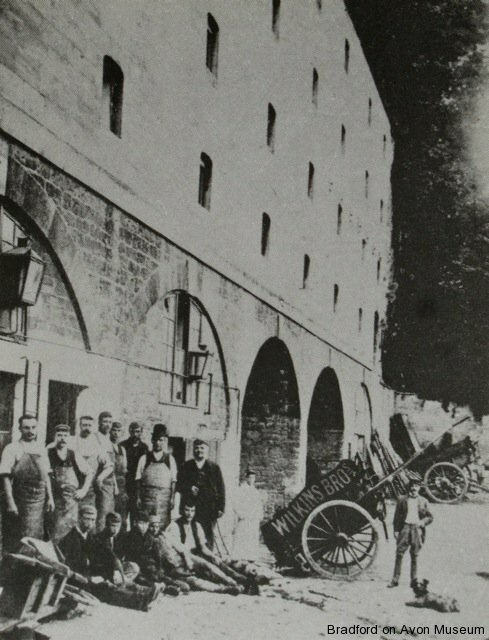 Some of the workers at the Wilkins Brothers brewery in Newtown in the yard of the maltings, with delivery carts.